Solar Systems are becoming ubiquitous in New Jersey. Unfortunately, there are very few websites which provide information about the different ways you can go solar. If you are like many thousands of New Jersey homeowners who are thinking about going solar the Ampericon blog is a good resource. Today, we will explore the purchase option for a solar system. Homeowner who want to own their solar system can either purchase their solar systems outright by paying cash or they can get their system financed. Financed systems are usually more expensive than cash systems as there are additional fees and interest costs. Ampericon partners with Sungage to offer a financed solar system. Most homeowners are able to finance a 100% of the systems cost. Interest rates start at 5.4% for a 10 year loan. There are 15 year and 20 year options as well with slightly higher interest rates. Lets look at an example. A home with an average monthly electric bill of $163 per month could get their new solar system installed and financed through Sungage and end up paying just $19 per month for their new solar system. The monthly loan payments for the solar system are $206 a month. This is offset every month by the amount your earn from your SREC's. At todays market prices you would earn $192 per month for your SREC's. Thus your net monthly payment would work out to just $19 a month. A couple of things to keep in mind while considering the solar financing option. The monthly earnings from SREC's are not guaranteed since SREC pricing is market driven. You could earn more or less each month from your SREC's. Additionally, you get a 30% tax credit when you purchase your solar system. If your annual household income is below $75,000 per annum you may not be able to take advantage of the tax credit and that would lower your savings. If you like what you see, you can give us a call at 609 945 2591 x 101 or email us jon@ampericon.com and we could work out a custom proposal for you. So for those of you who want other options, you can look at the solar lease or PPA. There are some excellent purchase program from the utility companies as well like the PSEG Solar Loan and the JCPL Sungage program. See my other articles on these programs to compare and contrast your solar options. Its time to go solar. Lets start with the basics. What is a solar lease or PPA ? The solar lease and the power purchase agreement (PPA) are very similar products and are used interchangeably. Large Solar companies like Solar City as well as local New Jersey Solar Installers like Ampericon have this product in their solar portfolio. In simple terms homeowners who avail of a solar lease/ppa are basically changing their electric utility company. Once you go solar via the lease or the ppa, you will start to pay the solar company every month for power instead of the electric utility company. Your electric expenses reduce dramatically once you go solar. There are no upfront costs for the lease or the PPA. The cost of installation, permits, design and construction are all taken care of by the solar company. Your only obligation is to buy the power produced by the solar system. Local installers like Ampericon reduce your monthly bill by 40% or more and offer you 6 months of free electricity. Larger solar companies like Solar City have much higher overheads and costs and are able to offer saving of around 20% and have no free months of electricity. Lets look at an example : Marguerite Kerr and her son Hunter of Hamilton New Jersey went solar in June of 2015. Prior to going solar their PSEG electric bills used to be peak in summer around $325 per month and settle at about $150 during the cooler winter months. They paid PSEG a total of $2,520 during the last 12 months. Thus, their average electric bill was $2520 / 12 = $210 per month. 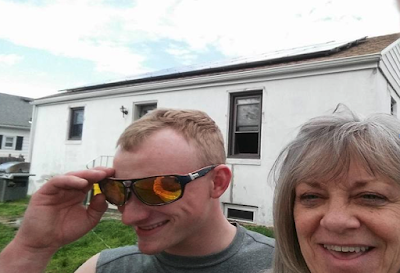 Once Marguerite and Hunter went solar in June 2015 their electric bill reduced to $127 per month. Switching to the solar lease saved them $997 during the year. That is 40% lower than their earlier electric bills. Ampericon even paid for their first 6 months of solar power. Hunter and Marguerite decided to go with Ampericon as the savings were significantly higher than Solar City (50% off vs 25% off). Ampericon used German solar panels and American micro-inverters and the Kerr's thought this combination of value and excellent product quality made them the better choice. Now, for the difference between the Solar Lease and the PPA. The solar lease is an equal payment plan with the same payment amount every month. For example the Kerr lease had an equal monthly payment of $127 a month. The PPA is a monthly payment based on actual usage. Over a year you end up paying the same amount for the PPA and the lease. That is why most people use the terms interchangeably. Homeowners never have to worry about the maintenance, insurance or warranty of the solar system as all that is taken care of by the solar company during the lease term (20 to 25 years). The solar lease or PPA is an excellent option for homeowners who want to go solar without spending anything out of pocket. If you want to save money without making any out of pocket investments, the lease/PPA is your best choice. So what about the bad ? As a homeowner you don't receive any of the incentives associated with the solar system. The tax credit, the renewable energy certificates etc are all taken by the solar company. And the lease term is usually 20 to 25 years, a very long time. The good news though is that it is easily transferable if you sell or move from your home. So for those of you who want other options, you can look at purchasing your solar system by paying cash or through financing. There are some excellent purchase program from the utility companies as well like the PSEG Solar Loan and the JCPL Sungage program. 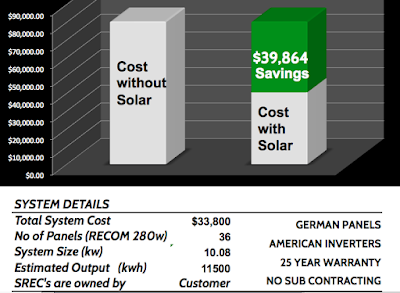 See my other articles on these programs to compare and contrast your solar options. So you are not sure if the solar lease / PPA is for you. Perhaps you want to buy a system but you don't want spend a lot of money. This JCPL ACE Sungage Program might be your answer. Its inexpensive and ends in just 10 years. 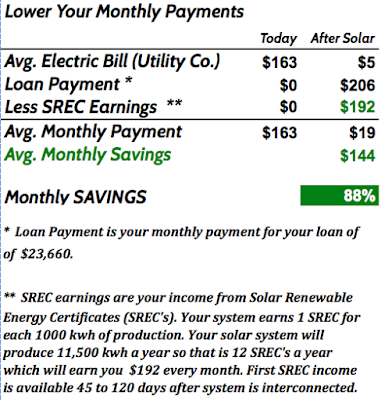 If you are an homeowner with JCPL or ACE as your electric utility and your household income is $75,000 or more you can get your solar system at $ 60 per month or lower. You earn a guaranteed income every month from JCPL as they buy your SREC's. Your monthly loan payments for the solar system are thus reduced to $60 or less. 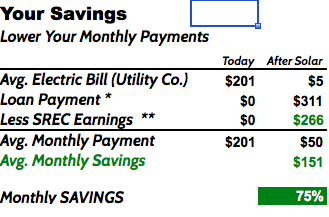 Here is an example - see how your $200 electric bill goes down to just $50 per month. No other costs. No hidden charges. Its the best way to go solar if you are a JCPL or ACE utility customer. The only qualification criterion are a household income of $75,000 or more per month. Give us a call at 609 945 2591 x 101 and ask about the JCPL or ACE solar program.